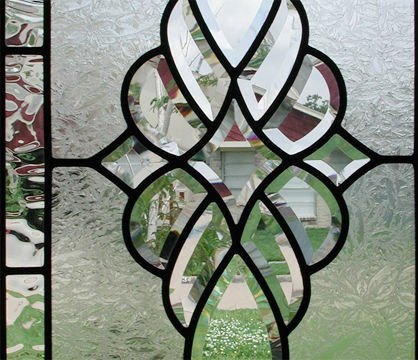 "HG340V" LEADED GLASS BEVELED SIDELIGHT WINDOW CUSTOM AT GLASS BY DESIGN. 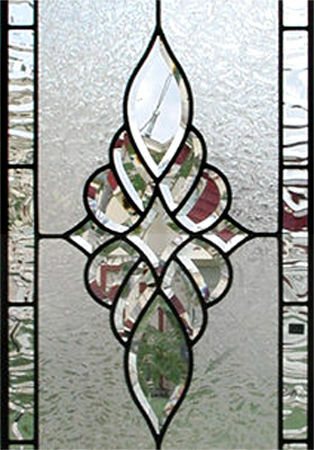 Leaded bevel glass sidelight window was 16" x 48". HG340 "bevel set" is 10 ½" x 22 ¼". The background glass was gluechip glass and the border was Flemish glass. This was all clear and/or textured glass with no color.